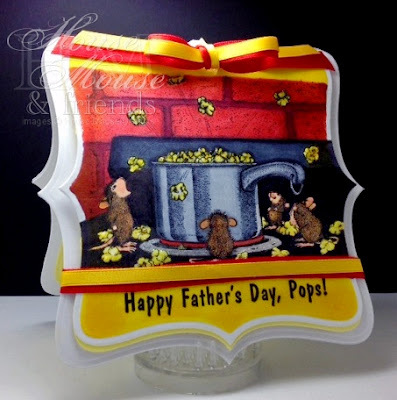 Here is a simple but fun House-Mouse card that I created for my 4 kids to give their wonderful Daddy in honor of this Special Day... I thought this HM& "Poppin' Good Time" stamp was fitting since it features four little mice, one for each of our children; Kelsey, Elli, Jacob and Carmen. It goes along perfectly with the fun saying that makes for a great play on words! This is also for this week's Featured Stamper challenge over at SCS found HERE: Check it out! I do hope you will enjoy Daddy's Day with your Fathers. Fun, colorful card! Bet he loved it! Great card,America, That sentiment is just perfect for the image. super cute and fabulous card america. house mouse and popcorn...two of my fave things! Sure your hubby loved it! What a cute card America...I love House Mouse...I'm sure your hubby loved it!